Construction of this ramp consists of the horizontal part with in-line lip and incline part with flexible lip. The upper ramp is placed directly in the body of the car, and the lower trapezoid-shaped one helps to control the turning angle, making it smoother. If the height of a standard container lorry is 1.2 m, the turning angle is 8°, and the corresponding slope is 14%. In the front part there are solid wheels of standard size 5.00х8 and a hydraulic system. Hydraulic system could be manual or electrical (220V or 380V). Hydraulic system could be adjusted on any ramp of MP and HL series. 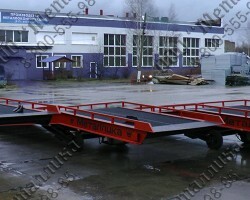 The hydraulic loading ramp "Hydra" is easily moved by the forklift with load capacity of 1.5 tons. The construction quality is confirmed by ISO certificates and 36 months of warranty! 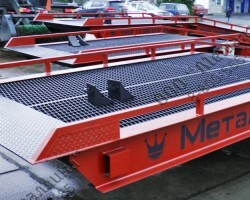 All MLC “Hydra” range ramps have the properly sized overall length and width. Shipment is possible in the vehicle of the customer or by a hired transport company. Our managers arrange delivery of any ramp directly to your site through proven logistics companies and at a profitable price. Delivery is carried out to all regions of Russia, CIS and Europe countries. 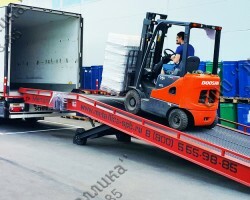 If you are ready to provide your own transport for shipment, then the loading is done by our company and is absolutely free! Average production time of the dock ramps with hydraulic system is only 20 days!